Bienvenidos! It’s your host Maria Alexandra, taking you on a whirlwind tour of Puerto Rico’s Capital Del Sol, LUQUILLO. Named after the region’s pre-Columbian chief, who died shortly after the Taino-Indian rebellion of 1513, Luquillo is a booming beach town, located 45 minutes east of San Juan. Rent a car or take a guided tour: this Sun Capital is the perfect destination for adventure seekers and history buffs alike. A quick jaunt around downtown and you’ll notice Luquillo’s rich African, Taino-Indian, and Spanish heritage, as it is reflected on its colonial architecture, street art, and delectable cuisine. Make sure to stop at La Iglesia Catolica San José to see its classic Spanish colonial facade. However, the real treasure lies inside: an intricate altar, with both natural and cultural Puerto Rican symbols. Got a few days? Then you should volunteer at one of Luquillo’s nonprofits or head mountainside to Hacienda Carabali. 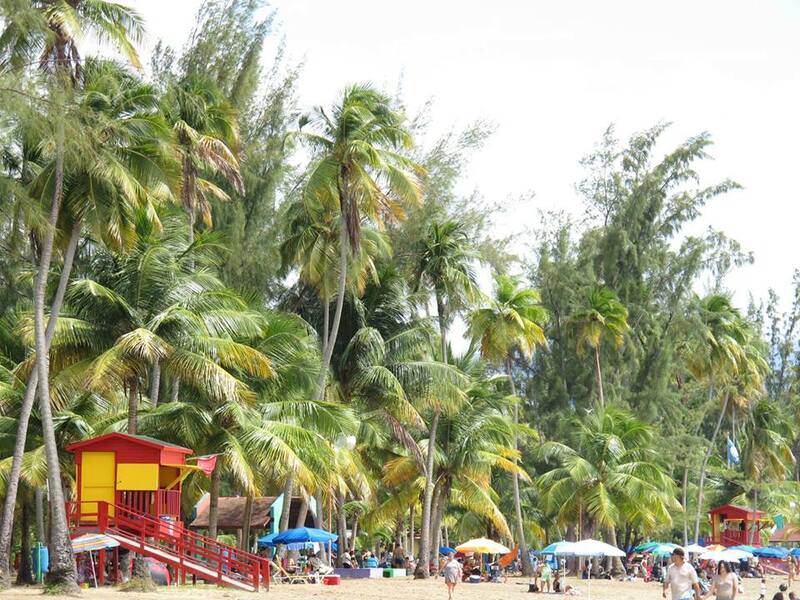 Then take a refreshing splash at Luquillo’s most popular beach: La Monserrate. I LOVE this Blue Flag beach, not only because it is great for swimming, but also because of the great Puerto Rican food you can find nearby. These are “chinchorros” — Puerto Rican slang for hole-in-the-wall eateries that serve local food to beachgoers serving alcapurria, it’s basically a deep-fried plantain or cassava batter, stuffed with either crab, any other seafood or beef. Maria Alexandra Laborde is a twenty-something thrill junkie that has lived, studied and traveled extensively throughout the Caribbean, Middle East, and North Africa. Through tales and snapshots, she shares her knowledge and love for the Arab world on her niche blog Travel The Middle East. Additionally, Maria is the author of LatinAbroad: The Nomadic Translator, where she shares her struggles, inspiration, and advice after traveling solo to more than 20 countries across 4 continents. Follow her adventures on Twitter @latinAbroad, ‘Like’ her Facebook page & ‘Pin' her on Pinterest. 21 Responses to "Things to do in Luquillo, Puerto Rico"
Hi where is La Monserrate in Puerto Rico? Wow! After watching the video I want to there as well! Hopefully next I could there. I just voted for her. I hope she wins! Good luck and I am closing my fingers for her. Sounds like an amazing opportunity for her! I hope that she wins. I might just check out her non-profits when I go to Puerto Rico. I’m sending a vote her way. Noooo! How did I miss out on this???? Darn. Awesome post……. It was very exciting to reading such an informative article. Today I’ve come to know some thing new. happy to put my beautiful little island on the map! Good luck Maria you’ve got our votes. Never been to Puerto Rico but it is a place I would love to visit. Maria has my vote! So does PR, love that place!!! thank you so very much for your support, Andi! I saw your comment on my own blog and it was so sweet <3 hopefully my dream will come true sooner rather than later! Nice one! Thank you very much for sharing this. Puerto Rico is such a nice place. I would love to visit this place together with my family. Wow, what an absolutely amazing opportunity! Can’t wait to read your book, Maria! Wow…you know you guys have made cry a bit here…! I’m SO humbled that people I’ve looked up to for years (you guys!) would take time of your busy busy adventurous lives to write such a sweet post, helping me reach my dreams and complimenting/promoting my work.